Hi Folks! 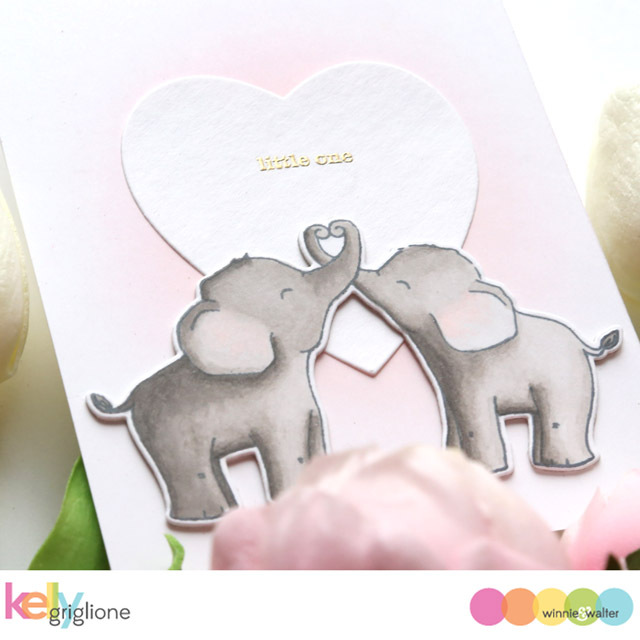 Kelly here with a sweet little pair of elephants from Big Hugs with Evelin T Designs for a happy pregnancy card. This card came about after working on a card for Winnie & Walter's 5th Birthday Celebration where I wanted to combine 3 different stamp sets and have a family of elephants on the card. After coloring the parents in gray, and then coloring the baby in gray, it looked kind of blah. So I scrapped that card and moved on to something else. Meanwhile, I still wanted to do something with these cute gray elephants, especially since I had worked on coloring them. So I grabbed a card base, did a little blending in the middle with the Life Changing Blending Brushes, added the heart diecut from Flawless Heart Cutaways, added the tiny sentiment from Welcome to the Family with Evelin T Designs, and I had myself a card! It's a simple card, but I do think that's a good choice for a baby card. I just love these sweet elephants twisting their trunks together to make a heart, and then there's a big heart behind them. I intentionally picked a tiny sentiment so the heart would have lots of white space. And, because this is for a tiny human. It seemed to fit. In the past I totally would have set these guys aside to use in a card "later" and then I'd probably never see them again. So I'm glad I took the extra couple minutes to find a forever home for them on this card. So worth it! Thanks so much for looking! Next time you end up with some leftovers, consider giving them a shot on another card before putting everything away. Super cute and sweet!!! Love the so delicate and impressive feel! Such a sweet card. I love your coloring and the tiny gold embossed sentiment. Sweet! Happy to see you turned them into a card. Oh wow--a totally wonderful card, Kelly! 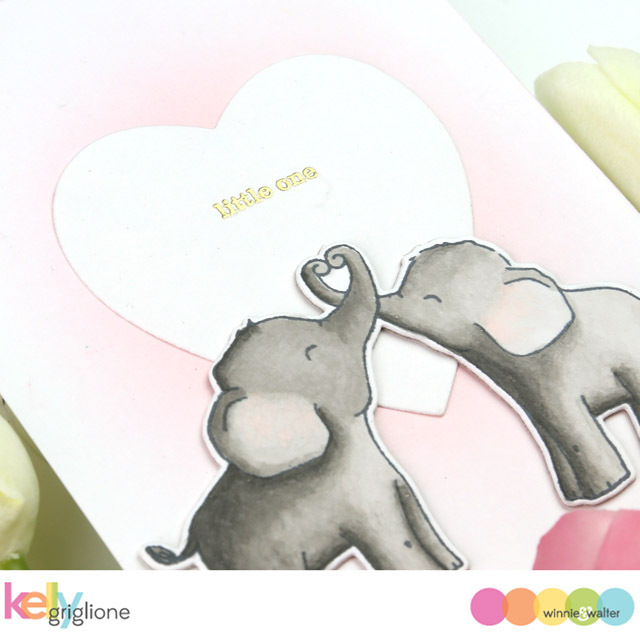 So glad you went back to these adorable elephants & came up with this card!